The definitive edition of Martin Scorsese's biopic of boxer Jake La Motta (played by Robert De Niro) is Amazon's Blu-ray deal this week! 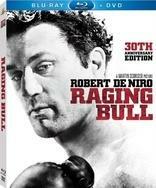 Amazon is selling 'Raging Bull: 30th Anniversary Edition' for $12.49 (58% off suggested list price). This release includes everything from the previous version plus four new featurettes and a vintage TV clip of Cathy Moriarty on Johnny Carson's 'Tonight Show' as well as a DVD copy of the film. Click here to throw in the towel and pick up this must-own classic before the deal expires May 21!